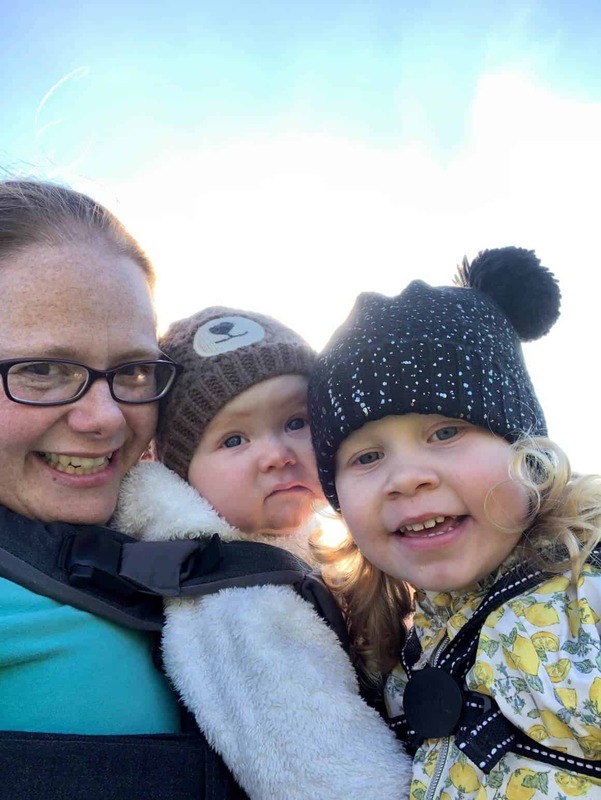 Today’s post is about recent finds and what clothes for my baby girl we have been given. We have been so lucky with family and friends giving us lots of clothes for baby girl. Isn’t funny that before I had baby girl I never used to take any notice of the children’s clothes departments in supermarkets? I can tell you now that’s changed! I’m straight over to the sale section hunting out bargains. I didn’t realise how fast babies grow. She is 9 weeks old and for the past couple of weeks she’s been in 3-6mths. It’s because she is very long, must take after her 6ft 4 daddy! Her sleep suits are baggy in the middle but fit her perfectly length ways. We picked up this cute little pink dress in the sale at Sainsbury’s for her. It was £12 down to £6. I love the little matching pants inside that come with them! 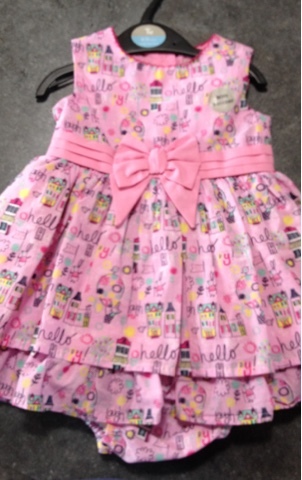 This little pink dress will be perfect for her great-grandmothers 100th birthday party in July. One of my husbands co-workers bought her this gorgeous little baby gap long sleeved vest. Baby gap clothes are so cute and good quality. 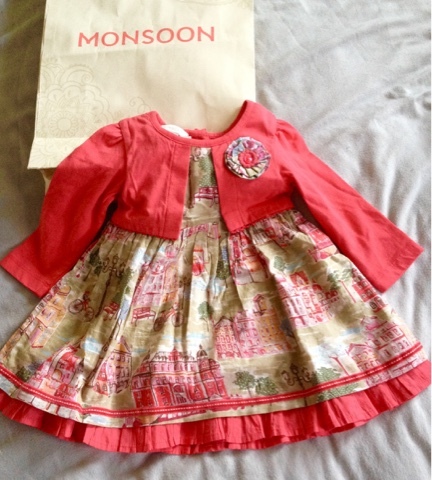 Another one of my husbands co-workers bought baby girl this stunning little red patterned dress from Monsoon. Again fantastic quality and beautiful design. 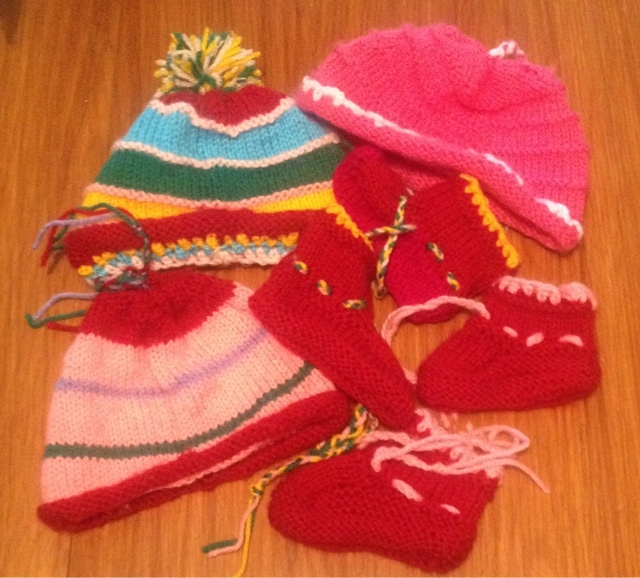 My mum loves to knit so has been knitting away cute hats and booties from any spare wool she has. 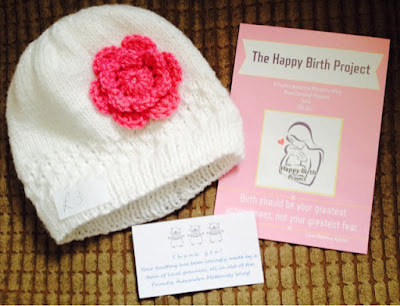 When we popped along to The Cornwall Baby Show last Sunday we stopped by The Happy Birth Project table where they had lots of knitted hats and booties for sale. We bought this cute white hat as the money was going to The Happy Birth Project charity which is run by midwives from our local hospital where baby girl was born. This was our baby girl’s clothes roundup for the past couple of weeks. 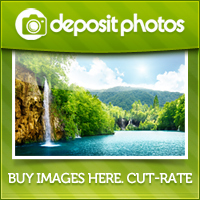 Do you love to shop for bargains in the kids section in supermarkets?